Home » blog » Are You a Fashion Trend-Setter… or Follower? Some women have that natural it factor that’s just absolutely captivating. And you can’t deny it when you witness a woman with this sizzling quality. People who have that one-of-a-kind it factor can walk down the street of any cosmopolitan city and demand the attention of passerby’s… men and women alike. Seeing someone whose style is so gracefully perfect is really quite an inspiring site. It makes you want to quite literally be a better person. No, fashion doesn’t change who you are. But it does reflect how you feel about yourself… and even how you WANT people to see you. It also has an almost magical way of making you feel better about yourself… and other people can see it! And when you find that balance between elegance and simplicity, your style becomes a method to amplify your emotions and rare allure to the world around you. While men are… well, men! Nobody can get enough of a woman who knows how to broadcast her beauty in a way that demands classy attention! There’s simply no denying a woman who can mesmerize those around her with her original grasp of fashion. Women like this are trendsetters. They’re the people who powerfully influence how others aspire to look and dress. Have you ever thought about yourself in that way? If you haven’t, you better start right now! Because you’re either being influenced or influencing the fashion culture. 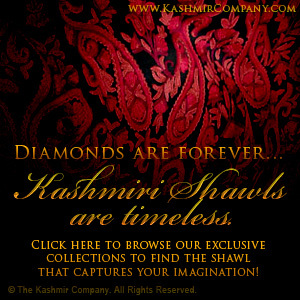 That’s one of the many reasons why Kashmiri Shawls are generating such a massive impact once again in the fashion world. 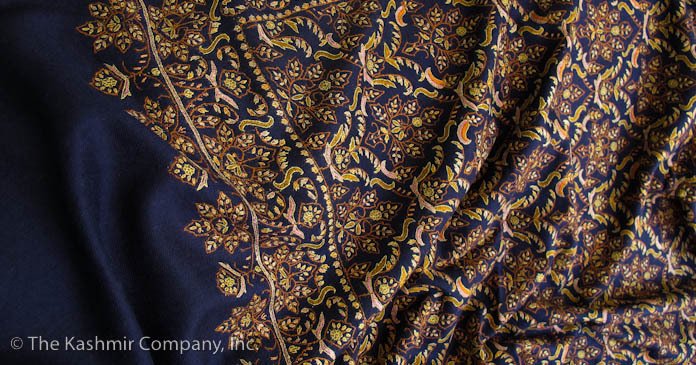 After all, shawls (and scarves) have been a huge part of fashion for hundreds of years. 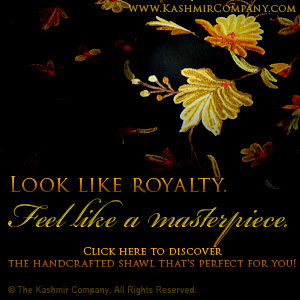 Royalty revered shawls for their unmatchable beauty and artistic expression. And while we all can’t be royalty, we can certainly feel regal with the clothes and accessories we wear! …We all know that fashion is like a sponge for retro looks and style. Original handmade shawls and scarves give you that highly sought after opportunity to refine and redefine your look in a way that nobody else can, while also paying homage to an unquestionably classic style. Women who are fashion-conscience often spend a lifetime looking for those unique pieces of clothing that express the emotion and character they want those around them to witness. Isn’t that what drives you when you’re looking online for clothes or shopping at the department stores? You want fashion-art that expresses who you are and how you feel! You seek one-of-a-kind clothing and accessories because you are an original fashionista who is always on the lookout for fashion-art that can accentuate all of your totally incomparable qualities! 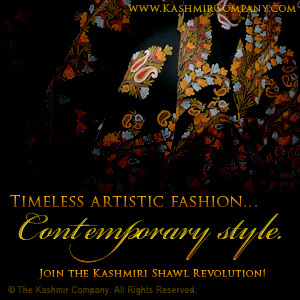 The Kashmir Company really wants you to take pride in being a trendsetter when you wear one of our authentic, handcrafted shawls or scarves. And remember, our shawls cost more than the dime-a-dozen, machine-made, rip-offs because they are 100% original. 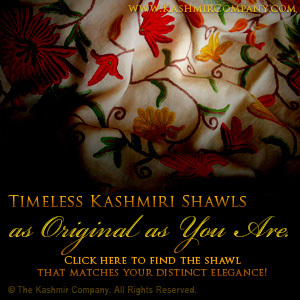 Being an authentic handmade shawl trend-setter is also choosing to become an avid supporter of the Kashmiri Arts and reviving a tradition of fashion-art that’s centuries-old! …I want you to know that even if you don’t always feel like it, you DO have that undeniable it factor. No, image isn’t everything, but the person you are expressing to the world around you must be deliberate to fully harness all of your unbelievable unique qualities and physical assets. Never let anyone tell you differently! P.S. While the people you work with, your customers or clients, and even perfect strangers will feel completely seduced by your unmatchable style and elegance… your family and friends just know you’re being you. They love you for who you are and how you dress. But secretly, they want to be like you too! This entry was posted onWednesday, December 14th, 2011 at 3:41 am and is filed under blog, Fashion. You can follow any responses to this entry through the RSS 2.0 feed. You can leave a response, or trackback from your own site. You can skip to the end and leave a response. Pinging is currently not allowed.